A study found in this week's edition of Proceedings of the National Academy of Sciences reports to have found one of the precursors to lager yeast (Saccharomyces pastorianus). The main yeast used to ferment beer, wine, and cider around the world is Saccharomyces cerevisiae, whose strains include the ale yeasts used by many craft brewers. Saccharomyces cerevisiae likes to ferment at room temperatures or warmer and quickly consumes sources of sugar. However, in the 15th century, Bavarian monks developed a new strain of yeast, rather by accident. The monks stored and matured their beer in cold, dark caves to help preserve one of their main sources of sustenance. This environment encouraged the development of lager yeast, which could endure the colder temperatures, but fermented slower than its ale yeast cousin. The resulting beer was cleaner and milder tasting than ale and it developed into a separate series of styles which are most popular worldwide today. Lager yeast is actually a different species of yeast than Saccharomyces cerevisiae, which earned it the different name. This is opposed to the various strains of Saccharomyces cerevisiae, which include the various ale strains and even baker's yeast. While the strains behave differently in the brew house and produce different flavors and aromas, they are basically the same yeast. Lager yeast is different all together and the differences allow it to endure and out-compete other yeasts in cooler temperatures. However, scientists were unable to fully map lager yeast's genetic parents. They knew that one precursor was Saccharomyces cerevisiae itself, but the other main precursor was unknown, until now. 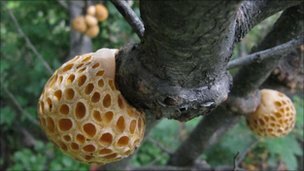 An international team of researchers discovered a yeast that lives in galls that infect beech trees in the forests of Patagonia. The yeast, which researchers named Saccharomyces eubayanus, is a 99.5% genetic match for the missing precursor to lager yeast. "Beech galls are very rich in simple sugars. It's a sugar rich habitat that yeast seem to love" says Chris Todd Hittinger, a co-author of the study. Combine a sugar rich environment with cold temperatures, such as the -2 degree C average daily lows in the Patagonia beech tree forests, and you have the perfect parent to lager yeast. How the Saccharomyces eubayanus got from Patagonia to Bavaria remains a mystery. For more information on the study, please look at the articles in the USA Today and BBC News.